PHOENIX – January 13, 2017 – The annual Rock ‘n’ Roll Arizona Marathon & 1/2 Marathon returns this weekend (January 14 – 15, 2017). The event, back for its 14th year, takes runners on a scenic tour of Phoenix, Tempe and Scottsdale. Registration and race week information is available at RunRocknRoll.com/Arizona. The event will once again feature two days of racing with the Rock ‘n’ Roll 5K on Saturday, January 14 at 8:00 am and the marathon, half marathon and 10K on Sunday, January 15 at 7:50 a.m. Participants can take the “Remix Challenge” by running on Saturday and any distance on Sunday to earn the coveted Remix Challenge medal in addition to each race’s finisher medals. The marathon and half marathon will continue to start in downtown Phoenix at Arizona Center (Van Buren St. and 2nd St). The half marathon and 10K will start in Tempe on University Ave. at College. All runners will cross the finish line at Tempe Beach Park. The 5K will start and finish in Tempe Beach Park. Live bands, cheerleaders and thousands of spectators will help motivate runners to the finish line. Upon finishing, participants are invited to relax with family and friends at the finish line festival and post race Toyota Rock ‘n’ Roll Concert Series headlined by Toad the Wet Sprocket. Race weekend kicks off with a two-day Health and Fitness Expo presented at the Phoenix Convention Center, where runners can find the latest in running technologies, fitness apparel, health and nutrition information and interactive displays. The Expo takes place on Friday, January 13 from 12:00 p.m. – 7:00 p.m. and Saturday, January 14 from 9:00 a.m. to 5:00 p.m. 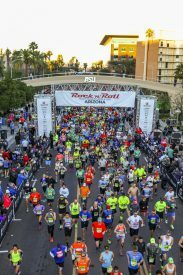 The 14th annual Rock ‘n’ Roll Arizona Marathon & ½ Marathon will take place the weekend of January 14 – 15, 2017. The fast and scenic courses will give runners a first class tour of the desert cities of Phoenix, Scottsdale and Tempe. Runners can rock to the sounds of live, local bands, along with enthusiastic cheerleaders to keep participants moving. The event concludes with a post-race concert and finish line festival headlined by Toad the Wet Sprocket. A two-day Health & Fitness Expo kicks off race weekend at the Phoenix Convention Center on Friday, January 13 and Saturday, January 14. The Expo will have numerous vendors featuring the latest in running gear, nutrition and training tips. To register for the race or for more information, visit RunRocknRoll.com/Arizona or follow us on Twitter @RunRocknRoll.